You might have read earlier this month that the opening date of the Uptown sculpture garden has been delayed from December 2011 to March 2012, but have you heard about the centerpiece sculpture chosen for the space? Because I’m often a month behind on blogs (except for a few), I was ecstatic this morning to read a Black Rock Arts Foundation (BRAF) blog post written a month ago about this piece. 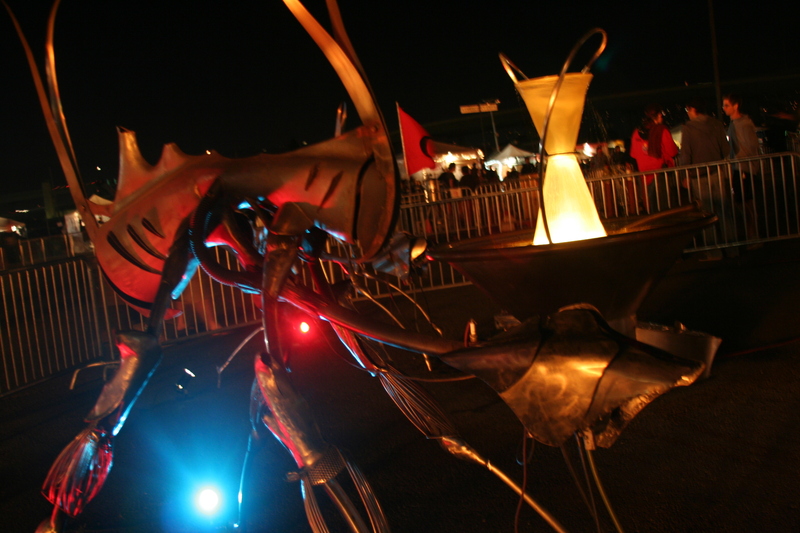 From the beginning of this fight – when advocates including myself convinced the City Council to approve an arts space instead of a surface parking lot in the lot between the Uptown apartments and the Fox Theater – I dreamed about Burning Man style art being featured there. I’m often frustrated that San Francisco gets to publicly display so many East Bay Burning Man art pieces, like Ecstasy and the Raygun Rocket Ship, and I thought this was the perfect space for Oakland to showcase East Bay art. Well, my dreams have come true. Holiday shopping can be stressful. Waiting in long lines, spending way too much time online trying to find the perfect gift, and driving around the Bay Area in traffic isn’t much fun. But there’s an easier and more rewarding way to do your holiday shopping – shop Oakland. When you shop at local Oakland businesses, you’ll generally avoid the lines (and much of the driving) and find some very unique gifts. Plus, your dollars will be circulated back into the local community instead of sent off to another city or country. Sound good to you? If so, join The Great Oakland Grown Holiday Challenge. Oakland Grown, which represents and promotes independent Oakland businesses and artists, is asking Oaklanders to commit to spending a certain percentage on holiday shopping at local businesses. You can either go all out and commit to spending 100% of your dollars here or figure out a percentage that works for you. I committed to 50% because I’ve already done some of my holiday shopping in Hawaii and at a goat farm in Pescadero, but I’m going to try to do the rest of my shopping here in Oakland. I signed up today for the Holiday Challenge and hope you’ll do so too. Oakland Grown will send you reminders and once the Challenge is over, if you fill out a survey you’ll be entered to win prizes from Oakland businesses. Check out the Oakland Grown Holiday Gift Guide. They have tons of ideas for local gifts you can buy at stores and online from jewelry, to furniture, to gifts for the little ones in your life. 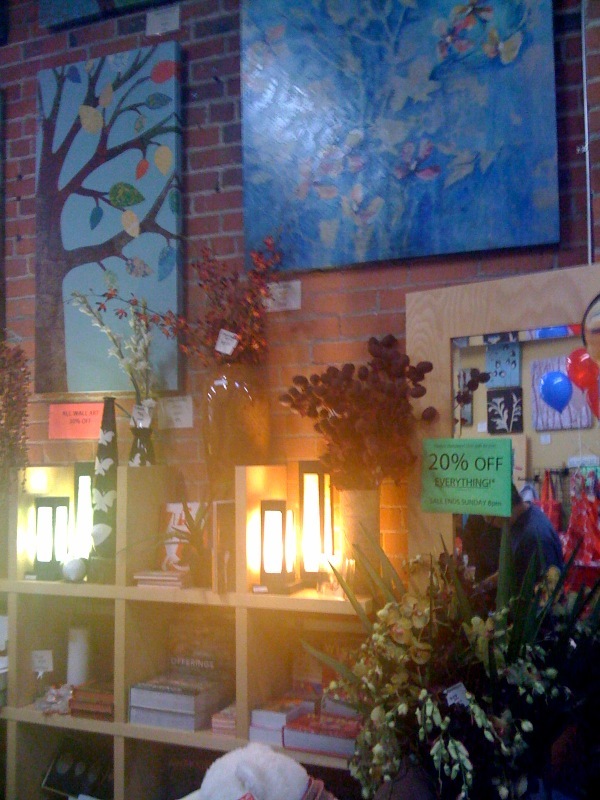 Go to the Crucible’s Holiday Gifty Art Sale this Friday-Sunday. I go to this every year and always find many incredible gifts. Not all of the artists are Oaklanders but many are and the rest are local to the Bay Area. If you’ve ever thought about taking a class at the Crucible (or gifting one), this would be the time, as they’ll be offering a 20% discount this weekend. Don’t have much time to do shopping or just want to get it over with? There are two Oakland stores that could each fulfill all or most of your gifting needs. I’ve written here before about Rockridge Home, where I’ve purchased dozens of gifts over the years. Since I’ve moved closer to Piedmont, I’ve discovered Nathan & Co, which is now my go to store for gifts. Both places have a huge range in prices, items, and styles – kitchen tools, books, jewelry, clothing, furniture, art, and just about everything in between. UPDATE: Somehow I didn’t find out about this until just now, but Oakland Urban Paths is hosting their First Annual Walk & Shop this Saturday. The walk will wind through three business districts via historic stairways and pathways. Sadly I have a meeting this Saturday, since I’d love to check out more of the stairways in my neighborhood, but luckily they offer a map so you can do the walk and shop on your own, which I plan to do. If you want an awesome Oakland Grown shopping bag to use while you shop locally, stop by Farley’s tomorrow (Thursday) from 5-9pm for the Oakland Grown Happy Hour. Farley’s will donate 20% of the proceeds from the evening to Oakland Grown, and it will be a great chance to meet business owners, artists, and supporters of local businesses. UPDATE: If you’ve procrastinated a bit on holiday shopping, not to worry – I’ve put together a last-minute holiday shopping guide for Oakland. This holiday season, there are a myriad of holiday local shopping opportunities – so many so that it might be hard to keep track of them! So I thought I’d write a brief guide to best places to shop for gifts in Oakland. This guide is just a selection of what Oakland has to offer for holiday shopping so if you have other thoughts on where to buy gifts, please share them in the comments below. The Full Moon Buy Night in October was incredible. There were tons of amazing vendors, delicious food, and lots of entertaining performances. This time, the event organizers are looking to make the Buy Night bigger and better for the holidays. They’re bringing the event inside to the Jack London Market, which I can’t wait to see! Hosted by Oakland Unwrapped, in collaboration with Jack London Square, ProArts, and Oakland Grown, this event will feature Oakland shops, artisans, fine artists and products that are manufactured here in Oakland! Items for all ages, genders and tastes. 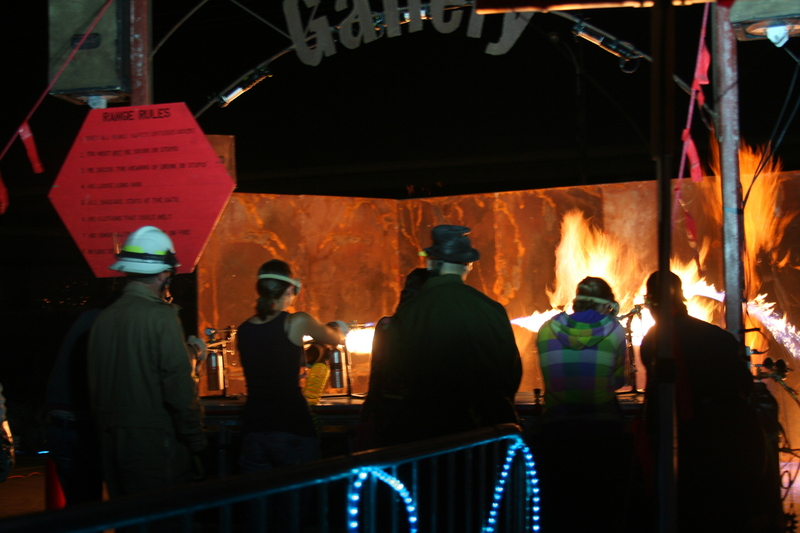 The event takes place on Thursday and Friday nights from 5pm-10pm at Jack London Market, 300 1st St. This weekend, the Crucible will be hosting its annual Holiday Gifty Art Sale & Open House. I try to make it to this event every year because I find it’s one of the best places to find unique gifts for your friends, family, and of course, for yourself. They have a little bit of everything – glass, jewelry, clothing, ceramics, and all sorts of stuff you’d never find anywhere else. 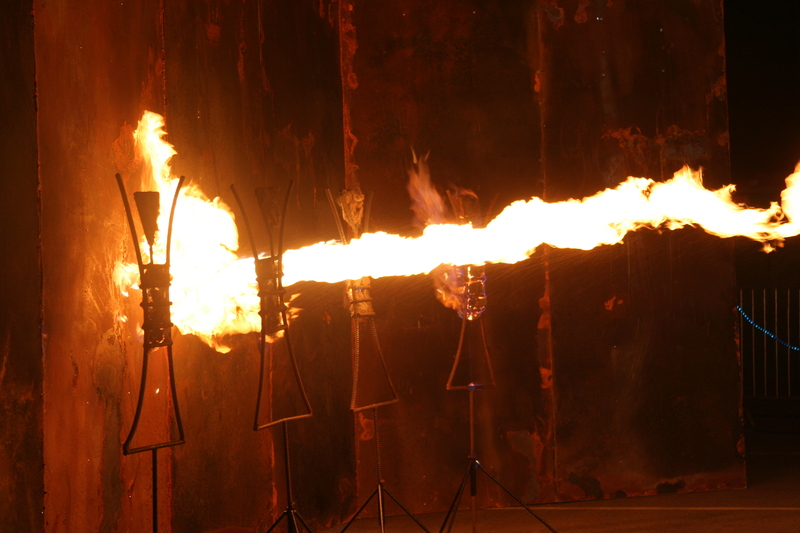 They also will be doing demonstrations of the fire arts that are taught at the Crucible, like glass blowing and welding, so you can get a sneak peek of classes. This event will take place on Saturday and Sunday from 10am-4pm at The Crucible, 1260 7th Street. The Crucible is accessible by the West Oakland BART station or by AC Transit lines 13, 19, or 62. On Friday, December 18, stores and restaurants throughout Oakland will stay open late (from 6-8pm) to give you a chance to do some last-minute holiday shopping. Several of the stores will feature live music, refreshments, discounts, gift wrapping, and a variety of other activities. Visit the website for a listing of all of the participating stores. If you’re the type of person who can’t handle shopping in person (or doesn’t have the time), you can still shop local online. Oakland Unwrapped has links to 130 Oakland establishments that have online stores featuring clothes, jewelery, wine, art, coffee, and just about everything other gift you might be looking for. If you’d like to give a gift to the Oakland blogging community (and to Oaklanders in need), please consider donating to the Blogoaksphere Virtual Food Drive. Our goal is to raise $2000, and we’ve raised $1650 so far. Thanks to all of the bloggers who are participating – A Better Oakland, Future Oakland, City Homestead, Today in Montclair, Fragmentary Evidence, Rebuilding Oaktown, Diary of an Oakland Shopgirl, Back to Oakland, Oakland Grown, and The Oakbook. If you’re a blogger who’s not yet participating, you can find all the relevant info and pretty buttons that V Smoothe created at the Blogoaksphere Virtual Food Drive web page. From Jean Quan’s newsletter: “Topics to be discussed include Port of Oakland Commission appointment; report back on Chicago LGBT Community Center visit; Oakland LGBT Community Center next steps and Oakland Pride Update. Bring unwrapped NEW toys to support the Oakland Mayor’s Community Toy Drive.” This meeting takes place from 5:30-7:30 pm in Hearing Room 3, Oakland City Hall. Among other items, the Council will be voting on granting eleven Mills Act contracts to historic buildings, extending the eminent domain authority under the Coliseum Redevelopment Plan, implementing a solar financing program modeled after Berkeley’s program, increasing the fee for residential parking permits, approving the City’s 2010 federal and state legislative agendas, approving a contract with an independent monitor for the police department under the negotiated settlement agreement, and hearing updates on several stimulus projects. See the full meeting agenda and check out my post about how to watch and understand City Council meetings if you need some guidance on how or where to view the meeting. The non-ceremonial parts of the meeting start at 7pm in the Council Chambers in City Hall, 1 Frank Ogawa Plaza. Several local elected officials are joining together to throw a holiday party. Hosts include Congresswoman Barbara Lee, Senator Loni Hancock, Assemblymember Sandre Swanson, Assemblymember Nancy Skinner, Alameda County Supervisor Keith Carson, Mayor Ron Dellums, AC Transit Director Joel Young, and Peralta Community College Trustee Abel Guillen. This event is free and refreshments will be served. This party will take place from 5:00pm – 8:00pm at Uptown Body & Fender, 401 26th St. For more info and to RSVP, visit the Facebook page. Come share food, conversation and holiday cheer at the inaugural Walk Oakland Bike Oakland Volunteer Potluck and Social. Don’t let the name fool you, you don’t have to be a volunteer – all WOBO supporters and enthusiasts are welcome. WOBO’s new partner, Xtracycle, has generously donated the use of their space, and the East Bay Bicycle Coalition and Linden Street Brewery have donated some of their specially crafted winter beer, so you won’t want to miss out on the fun. It is a potluck so you’re asked to bring something in the way of food or a non-alcoholic beverage. WOBO’s trying to be light on the planet so you’re encouraged to bring your own plate, glass/mug and utensils if possible. There’s plenty of bike parking in the gated Xtracycle lot and places to lock up to, so if you bike, definitely ride over. The party takes place from 6pm-9pm at Xtracycle, 1078 60th Street. Find more info and RSVP on Facebook. Who needs a boring mall when we’ve got an amazing variety of shops, artisans, and locally made items right here? Get your holiday shopping all wrapped up at the Holiday Buy Night, hosted by Oakland Unwrapped, in collaboration with Jack London Square, ProArts, and Oakland Grown. Two floors, two nights INSIDE the warm & cozy Jack London Market! An Oakland shopping mall-ternative featuring the best of local and indie gifts, art, accessories, clothing and more from Oakland Unwrapped!, Pro Arts and Oakland Grown. Choose from Oakland shops, artisans, fine artists and products that are manufactured here in Oakland! Items for all ages, genders and tastes. The event takes place on Thursday and Friday nights from 5pm-10pm at Jack London Market, 300 1st St. Find more info on vendors and entertainment on Facebook. From the Temescal District website: “Popcorn, candy canes, hot chocolate, carolers, and lively merchants await you on Telegraph Ave., all weekend long. Show your moves at the outdoor ice skating rink (skates available) at 49th and Telegraph. Drop in on your favorite local merchants for a little last minute holiday shopping. And don’t forget to smile when you take your picture with Santa! On Sunday: celebrate the work of Oakland artist Mark Brest van Kempen at the community dedication of Views of the Greenbelt. This public art project, commissioned by the City of Oakland, is a series of sculptures focused on the flora and fauna of the Rockridge Temescal Greenbelt. The dedication event starts at the art sculpture podium adjacent to the DMV parking lot (5300 Claremont Avenue) at 11 AM. Enjoy a brief walking tour of select sculptures ending with light refreshments at Hardy Park.” This event takes place on Saturday and Sunday from 12:30-4:30pm in Temescal. This weekend, the Crucible will be hosting its annual Holiday Gifty Art Sale & Open House. I try to make it to this event every year because I find it’s one of the best places to find unique gifts for your friends, family, and of course, for yourself. They have a little bit of everything – glass, jewelry, clothing, ceramics, and all sorts of stuff you’d never find anywhere else. Though there are plenty of artsy holiday sales going on at this time of year, the Crucible’s generally has the best entertainment. Where else can you go to shop and see fire dancing stilters? 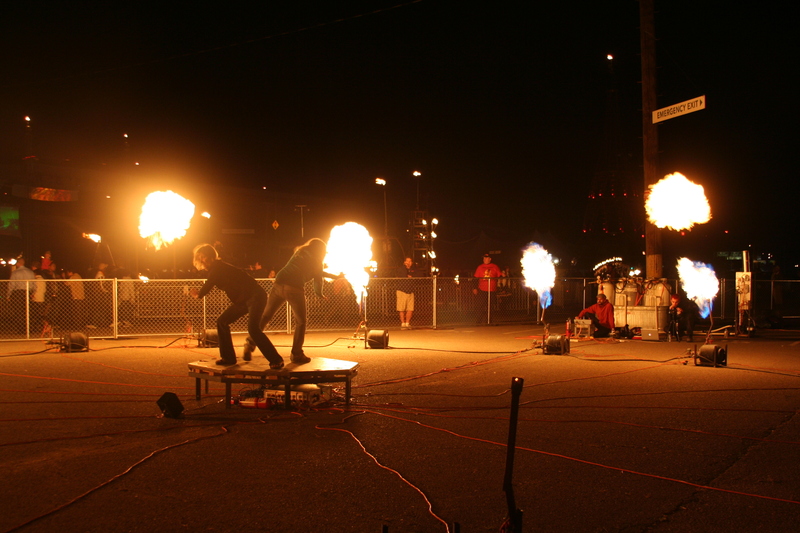 They also will be doing demonstrations of the fire arts that are taught at the Crucible, like glass blowing and welding, so you can get a sneak peek of classes. This event will take place on Saturday and Sunday from 10am-4pm at The Crucible, 1260 7th Street. 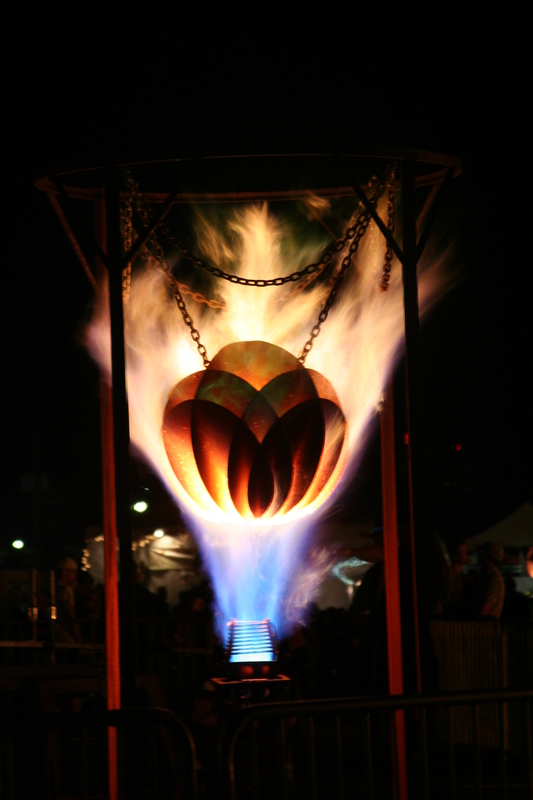 The Crucible is accessible by the West Oakland BART station or by AC Transit lines 13, 19, or 62. 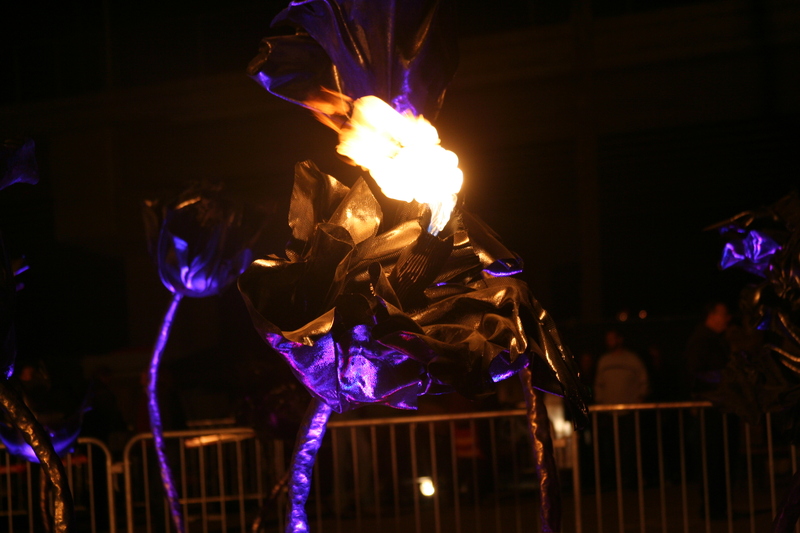 There were strange creatures featured throughout the festival, including ones without fire elements. There was also fire flora and fauna, like this field of fire flowers. 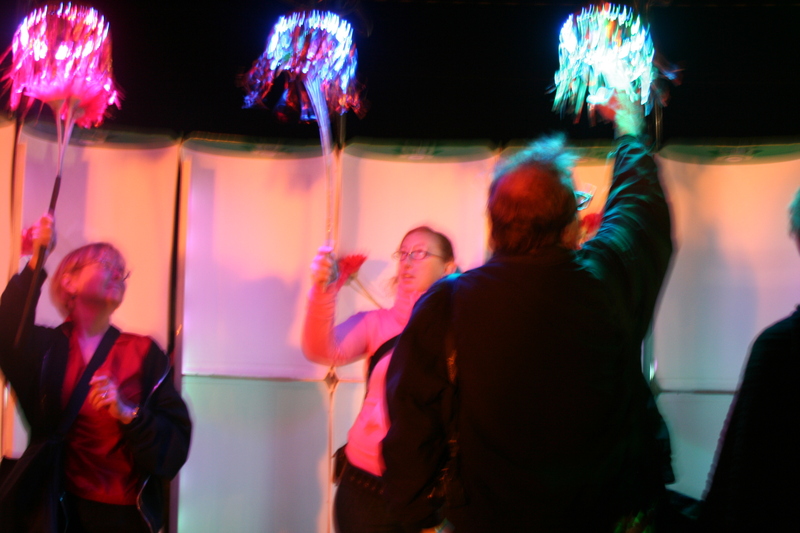 And one of my favorite pieces of the night was these hanging flowers, which lit up and played music when you touched them. It was great to see strangers interacting with the art and each other, with huge smiles on their faces. At these poor innocent men. 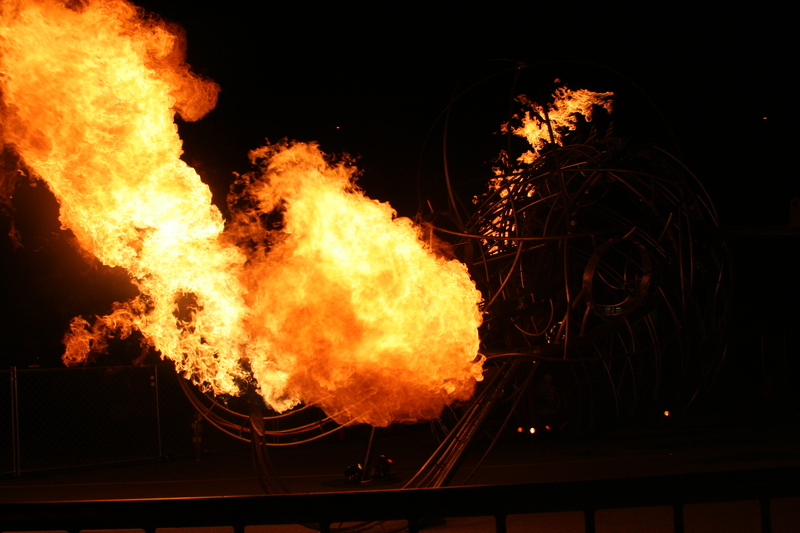 2PiR, one of my all time favorite Burning Man pieces, was back. I can't tell you how much fun I've had on this creative, Oakland made art piece. 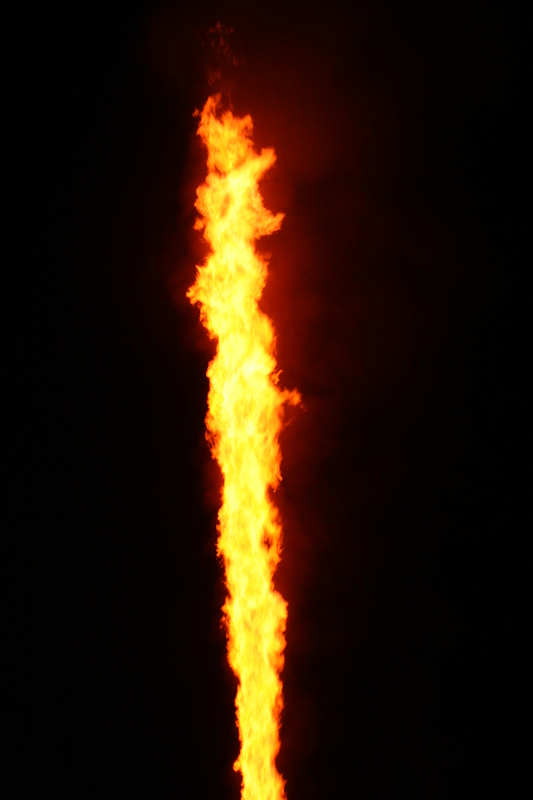 You stand on the platform and dance, and the motion sensors on the platform set off fire. The mom and daughter above looked like they were having the time of their lives. 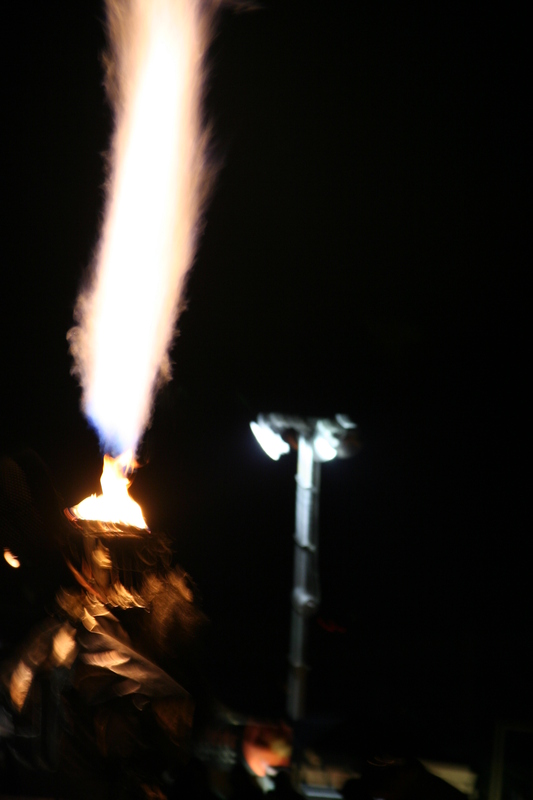 Of course, there was plenty more fire just to look at, some which was quite beautiful and artistic. 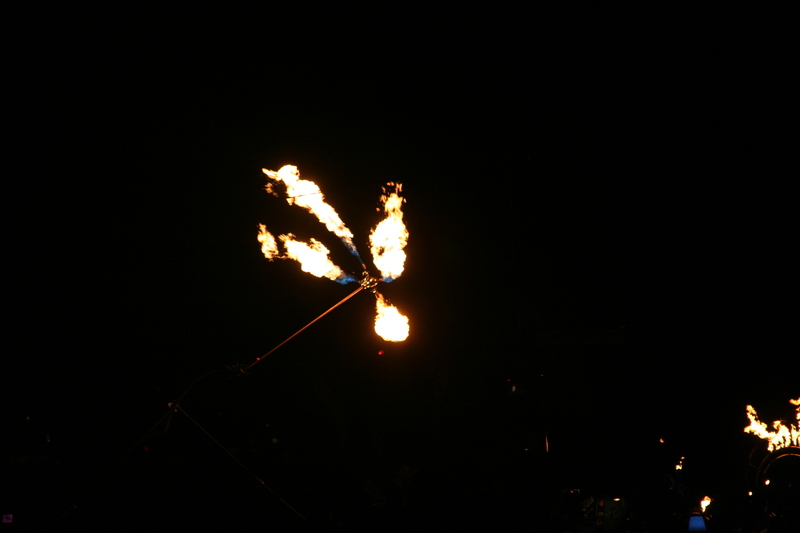 And the pendulum of fire that swung back and forth. One of the most memorable parts of my night was seeing the gnome, which was made by a group of East Bay residents, including a friend of mine. Pictured above is the small fire that came out of his head, which anyone could activate by pressing a button.